I’m going to be unabashed here folks: I love Milwaukee. I love the Milwaukee vibe, both easygoing and friendly. I love the Milwaukee landscape – huge lake, post-industrial scars worn proudly, river for kayaking and strolling along, Third Ward full of gracious 19th-century warehouses and storefronts. I love the way history is available everywhere you turn, without reproach, abandoned spaces being unostentatiously reclaimed for new uses, rail paths turned into urban gardens and biking trails, breweries becoming hotels. And perhaps most of all (and no surprise to you I’m sure) I love Milwaukee restaurants, quietly showing Chicago and perhaps even Philadelphia or New York a thing or two about local goodness, inventive preparation, or just old-school Wisconsin cheese and beer. On our first night in Milwaukee, we were treated to a complimentary dinner at a restaurant that is also a local institution. Mader’s Restaurant started out in the early twentieth century serving simple food to workers from the breweries up the hill. It’s fancier now to the tune of three million dollars in German art and antiques, which the owners lovingly display around the dining room and bar. 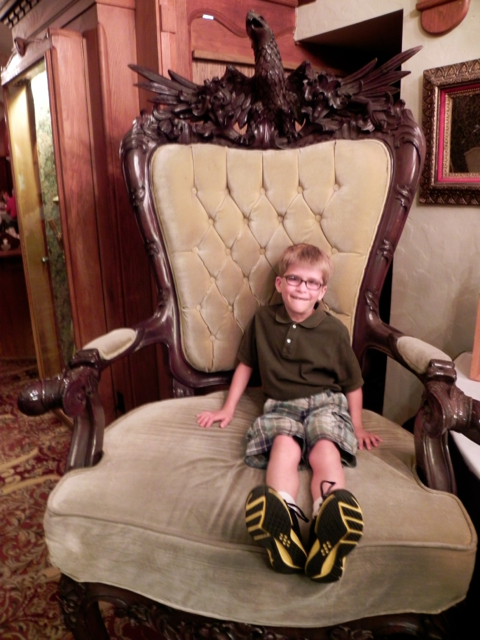 There are many things about Mader’s that appealed to my children: Teddy loved ogling the suits of armor in the restaurant’s windows and sitting in the giant armchair that adorns the entryway. 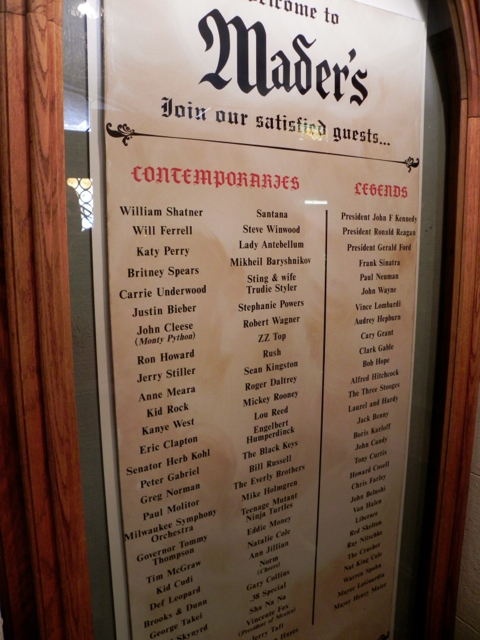 Tommy shared on Instagram that he was eating in an establishment that at one time was also frequented by Katy Perry, Usher, and Will Farrell (he seemed less impressed that John F. Kennedy once dined there as well). He wasn’t the only one who enjoyed looking at the autographed photographs of various celebrities and politicians who have eaten at Mader’s over the past century – I watched every adult who passed the impressive wall of photos lining the hallway that led to the restrooms pause and point and nod in recognition. And truly, what child wouldn’t be happy to be served one of these babies? Bigger than any child’s head, bigger than a dinner plate, bigger than any other pretzel you’ll find anywhere. We didn’t leave Mader’s hungry after feasting on reuben rolls stuffed with corned beef, sauerkraut, swiss cheese and then deep fried; smoked pork loin; bratwurst and knockwurst from Usinger’s, the sausage maker across the street. 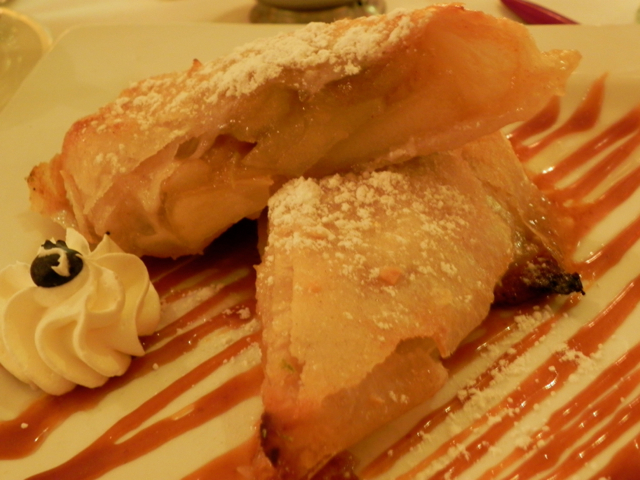 The apple streudel, a house specialty, is rich with caramelized apples and golden raisins. And Teddy just had to have the meringue topped with ice cream, whipped cream, and berries, which, according to him, looked like the Taj Mahal. 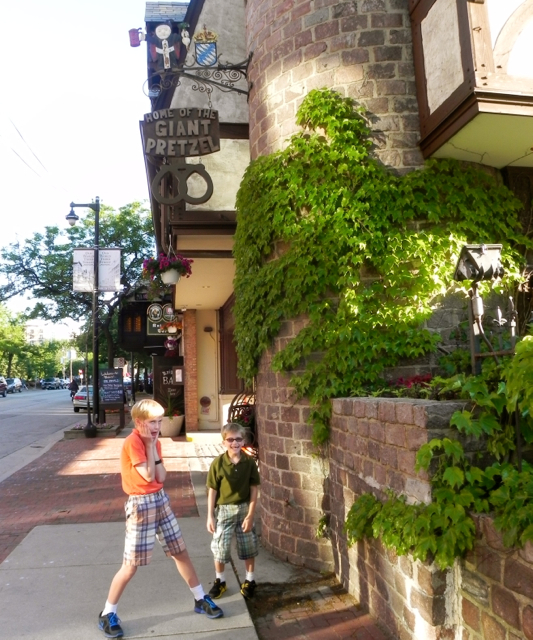 But it was the pretzel that the boys loved the most, and it was the pretzel that came back to our hotel with us in a box to be eaten on our drive out of town, a buttery reminder of Milwaukee restaurants and why our time there was so delicious. This post is the second of my Postcards from the Road series for Summer 2013 – quick photo posts that give you a glimpse of our travels while we’re still on them. Many many thanks to Mader’s Restaurant for providing such a delicious meal and fun evening free of charge. 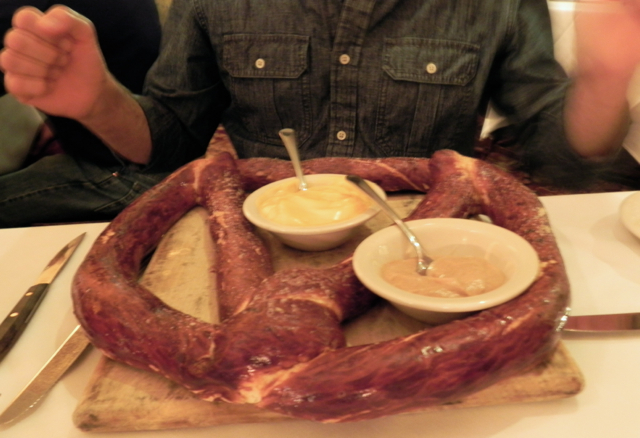 My opinions about giant pretzels (and everything else you’ll find here) are my own.